It rained. But what more could we ask for, when the 65th Toronto Sea Scouts were hiking 12 kilometres along the Humber River, learning about the damage wrought by Hurricane Hazel 55 years ago? Rain helped put us in the mood, and the Scouts were in awe when they got to the Bloor Street viaduct and saw the blue wavy line painted on one span more than five metres above them, which showed how high the water level had got on Oct. 15, 1954. 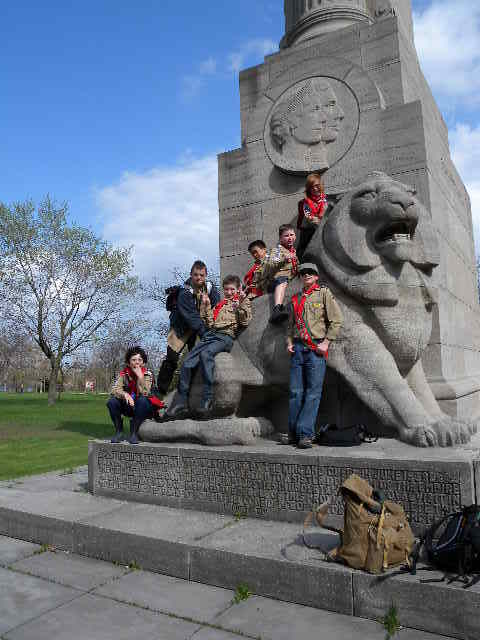 We had seven Sea Scouts, two leaders and a parent on the all-day hike, which started north of Raymore Park (where more than 30 people were swept away to their deaths when a wall of water knocked their homes off their foundations) and ended at the pedestrian bridge where the Humber meets Humber Bay and Lake Ontario. Despite our rain gear, we were soaked by noon, but the sun broke out in the afternoon when we paused to invest a new Sea Scout on the banks of the river. Legs were getting tired as we hiked by the marshes at the south end of the Tommy Thompson Trail, but there was still enough energy to climb all over the lion monument at the end of the Queen Elizabeth Way when we got there, before catching a streetcar back to our home neighbourhood.